Eastside Projects and Supersonic Festival are looking for performers for GOTTESRAUSCHEN (GOD’S WHITE NOISE) conceived by artist Christian Jendreiko. Taking place at Eastside Projects on Saturday 23 October, 12–7pm. We are looking for people interested in going through the GOTTESRAUSCHEN experience: You do not need to be a trained guitar player, however you should be interested in sonic exploration of the self. The full performance lasts 7 hours — involvement for the duration is optional: players may come and go. Performers are required to bring their own electric guitar and amplifier, which can be stored securely at Eastside Projects for the full festival weekend. Contact info[at]eastsideprojects.org for more details as places are limited. Düsseldorf-based artist Christian Jendreiko is known for making actions with large ensembles of trained or untrained performers in novel, site-specific settings. Jendreiko specifically seeks to reconsider acoustics as aspects of how body and mind are constructed, through a decentralized and sculptural approach towards performance. Lasting anywhere between two and seven hours and featuring classically trained musicians alongside untrained performers in nonhierarchical and improvisatory fashion, Jendreiko transforms groups into social sculpture. For the Birmingham premiere of ‘GOTTESRAUSCHEN (GOD’S WHITE NOISE): Action for Players, Guitars & Amplifiers’, a number of musicians and artists will perform at Eastside Projects over the course of 7 hours. 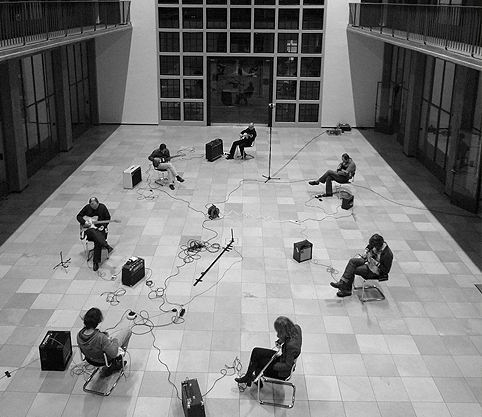 Intended as a performance for an indeterminate number of guitarists and amplifiers, and taking its cue from a passage by Friedrich Schiller on man’s relationship to a series of sensual and formal compulsions (“For all beauty is ultimately but a property of … movement”), GOD’S WHITE NOISE will unfold over a single day, with guests free to enter, circulate throughout, and remain in the gallery space as long as they wish.